Bermuda is 700 miles from the closest shore—and care—in the world. Located on a private beach, The Loren at Pink Beach is a chic and minimal property with farm-to-table dining. It’s roughly the size of Manhattan and faster to reach than the Hamptons, if you actually live in Manhattan—helicopters notwithstanding. First class and Global Entry ease the pain of travel, but there is no substitute for a direct two-hour flight. 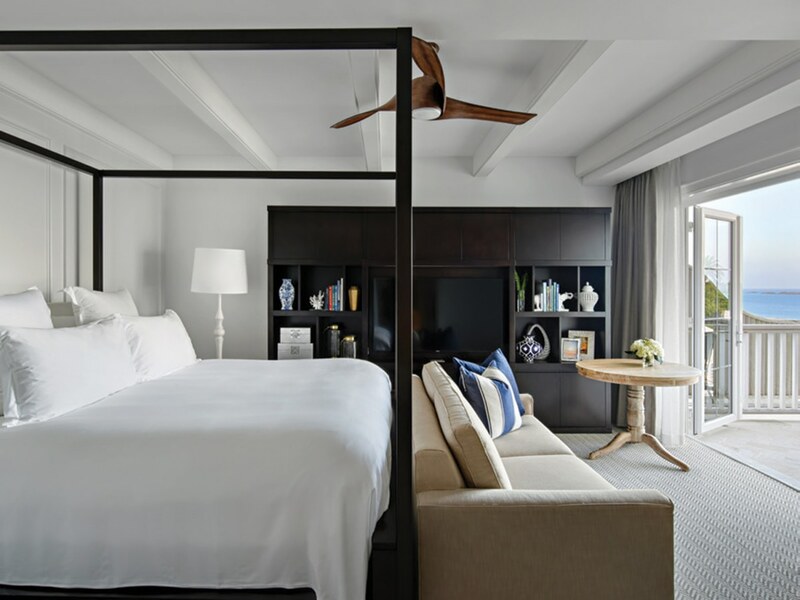 We left Washington, D.C., at 10 a.m. and were lounging beachside at the island’s chicest property, The Loren at Pink Beach ($370 per night), before 2 p.m. Opened in June 2017 by Sardis Developments Ltd./Stephen King, the whitewashed modern masterpiece would fit in fine in Palm Springs. Its clean lines and crisp blank canvas of poolside parasols postured over chaise lounges are a picturesque complement to the cool cyans and deep azures of the Atlantic, which start where the infinity pool ends. The boutique property has 45 suites and two restaurants: the fine-dining Marée and the more casual oceanside concept Pink Beach Club, which takes its name from the pink-hued sands of the hotel’s private beach. Executive chef Tim Sullivan oversees kitchen operations. “Our philosophy is simple: We are seasonal, sustainable and, when possible, local,” he says while showcasing a 35-pound rockfish caught earlier that day. “We took time to travel with the fishermen and understand how they fish and how the fish is handled from the second it’s caught to the next few hours when it’s delivered,” he tells me. Sullivan and his team are bringing farm-to-table cuisine to Bermuda. While I didn’t see a 35-pound rockfish on my excursion with Dive Bermuda, I did see plenty of other species and a few spiny lobsters during a thoroughly professional two-tank dive ($150) that included exploring a sunken tugboat and navigating mazelike coral formations. 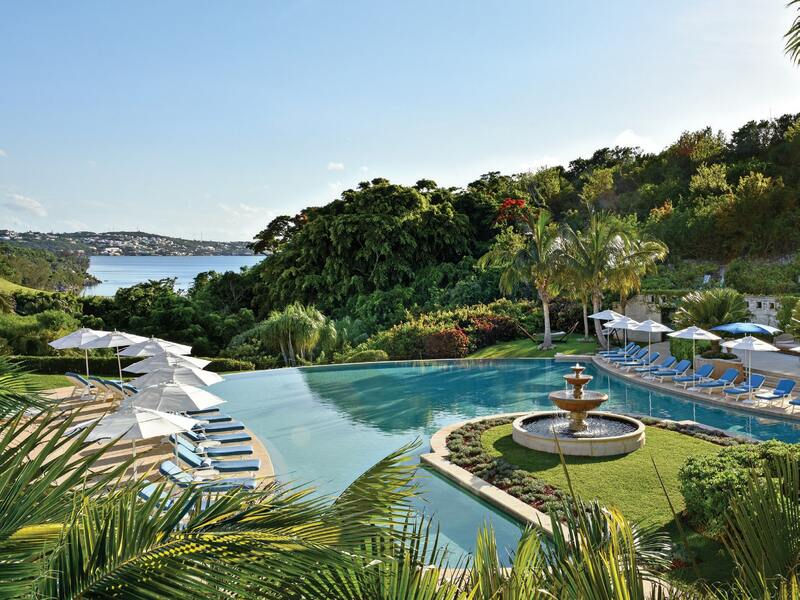 The pool near the Rosewood Bermuda’s Island Brassiere, Tucker’s bar and the Sense spa is the largest of three on-site pools. 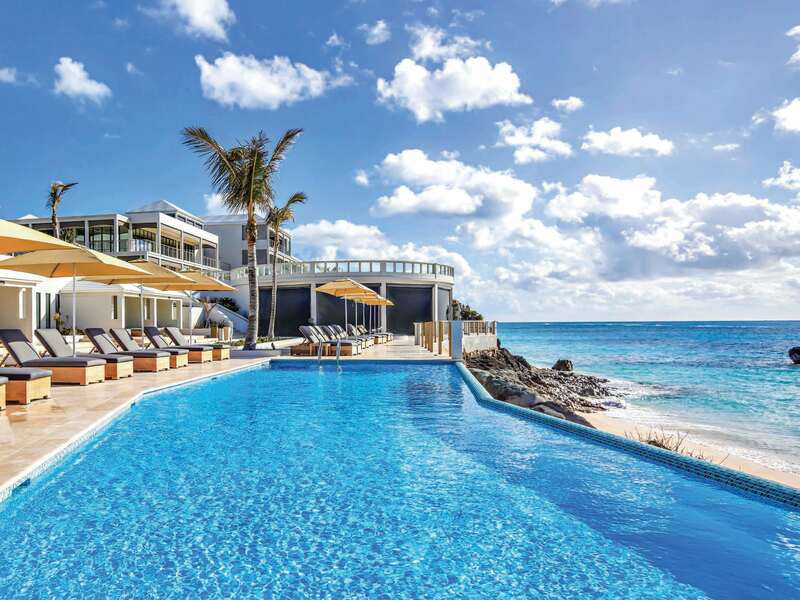 Bermuda is historic, charming and accustomed to discerning travelers, but luxury reaches its pinnacle at Rosewood Bermuda (Ocean View suite $2,085 per night), especially now that a $25 million renovation is complete. Sprawled across 240 meticulously manicured acres, the resort is large, but feels intimate. Ocean View Poolside King rooms (from $955 per night) offer private poolside bungalows. The signature pool near gourmet restaurant Island Brasserie provides a quintessential resort vibe, while the Beach Club situated on the island’s largest private beach plays host to an idyllic beach day. Ultimately, though, it’s the hospitality and attention to detail that make this place the crown jewel of Bermuda. (Tip: Book a suite to receive a dedicated golf cart, which is necessary to navigate the vast property.) Activities? Try the blissful spa; play golf on undulating fairways of the world-class course; or rent sailboats, kayaks and boats. During a three-hour rental ($190), I captained a 22-foot Boston Whaler to nearby empty beaches lining Castle Harbour. There is plenty to discover out of the water too, like the quaint downtown of St. George’s. Meander the centuries-old streets and take in charming diversions, such as the island’s perfumery, Lili Bermuda. Its custom fragrance, recreated from a perfume found in the 1864 shipwreck, Mary Celestia, makes for a great gift. The island’s treacherous outer reefs have sunk many ships over the centuries, none more famous than Sea Adventure, forever immortalized in Shakespeare’s The Tempest. You can tour a replica of the ship in St. George’s. Rosewood’s spacious Ocean View suites offer sweeping views of Castle Harbour. The rich mélange of Bermuda’s cultural influences are on full display Wednesday nights in downtown Hamilton during the weekly Harbour Nights summer street festival, where Gombay folk dancers dressed in Native American motifs pound out African rhythms before giving way to a British red-coated military marching band whose set includes “The Stars and Stripes Forever,” accompanied by a group of Scottish bagpipe players. Locals say nothing in Bermuda is original. It’s true—the only life here arrived either by flying, swimming or drifting. But, like Bermudian culture, it’s all been refined over 400 centuries through resilience and an appreciation for finer things. It all awaits ready to be unlocked like a long-lost fragrance from the bottom of the Atlantic Ocean.